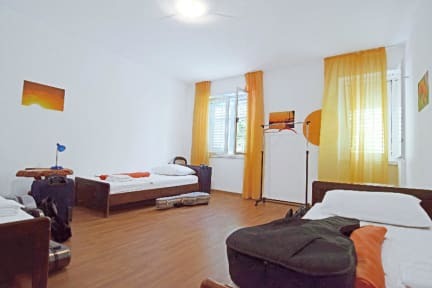 We have 5 charming, spacey rooms provided with price included air condition: private Blue room with two twin beds, private Yellow room with big double bed, private Green room with three single beds, and Orange and Violet rooms are four bed mixed dorm rooms. There are two separate bathrooms, one for the Gentlmen and one for the Ladies. Large terrace and garden for relaxing and hanging out with beautiful view on nearly beach. Our house is clean, safe, friendly and simple. Provided free wi-fi and air condition in each room. Free linen and towels. All the facilities are situated nearby. Lots of restaurants, bars and clubs in the vincinity. Check out from 07:00 to 11:30. We promote friendly behaviour in the lodging. I had an awesome stay - everything was perfect! All the facilities are super clean, I could even check in a bit earlier and the property is opposite the main beach. I can only highly recommend staying there! Our stay at the Hostel D&D in Supetar was great! The rooms were very clean, big and comfortable and our hosts there were very friendly, helpful and up for a chat. :) the location is perfect too, it's right in front of the beach and in the center of Supetar where you find a variety of bars and restaurants. I would definitely go there again next time! Thank you for the good times we had! LOVED IT! BEST HOSTEL IN CROATIA! 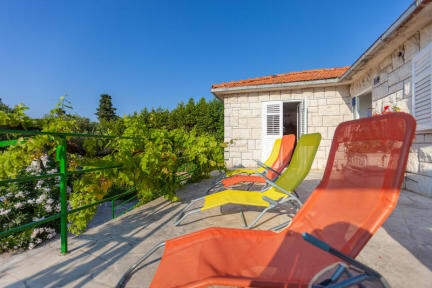 Perfect location in Supetar. The hosts, mother and daughter, lovely, absolutely delightful and so welcoming. They keep the place spotless and comfortable. I really appreciated the two big lovely white towels, it gave a luxurious hotel feeling. The showers were great and wifi strong. It's a really friendly and chilled out place. You are guaranteed to meet new people on the terrace. Good for the chilled out, friendly solo traveller as well as groups. Thanks a lot! Amazing facilities (showers) and rooms were large and beds were comfy. The owner is kind and knowlegable. Excellent location near the coast and shops, but doors do not lock. Amazing location! Could not get any closer to the beach. Rooms were very clean and really nice people. Would have loved to stay another night but were moving onto next location. We had a lovely stay here, the room was clean and spacious and bathroom was spotless too with enough room in the showers for changing, which was really nice. The owner was also really nice, we went to return a key we had accidentally taken with us when we left and she let us lie on the balcony, charge our phones and use the bathroom, even though it had been three nights since we had stayed there. Really recommend although there were no cooking facilities which made cheap eating harder. I went at the end of the beach season, so I got a whole room to myself. There were only a few other guests, so I can't really comment on atmosphere. The host is very friendly, and the hostel is a short walk to town, and an even shorter walk to the beach. Really lovely place cannot recommend enough! We had a two bed room which was gorgeous and pristinely clean. The showers were also heaven with enough space to change in. The host is super friendly and nice and is v helpful. It is a bit of a walk into town but there's some great places to eat nearby like Salt & Pepper.